Burton House is rated “Very Good” on Trip Adviser. What a find!! Clive’s home is situated perfectly. Our young boys loved the house and found the whole experience a real adventure. We had a fantastic stay and would definitely visit again. Ground floor – spacious living room with double sash windows, two and three seater sofas, open fire, colour 32″ TV, DVD and CD player. Snug with futon, children’s toys and sea views to rear. Cellar kitchen – Fully fitted kitchen with dining table and chairs. The kitchen has electric hob with under counter oven, fridge (with small freezer compartment), coffee and bread maker, washing machine and television. Please be advised that there is some limited headroom in the kitchen. 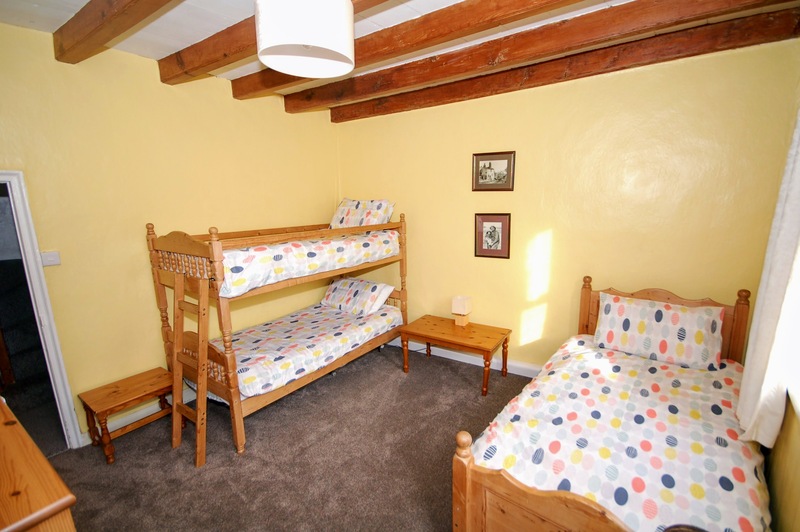 First floor – Bedroom with double sash windows, 1 bunk bed and 1 single bed with room for cot (travel cot supplied). 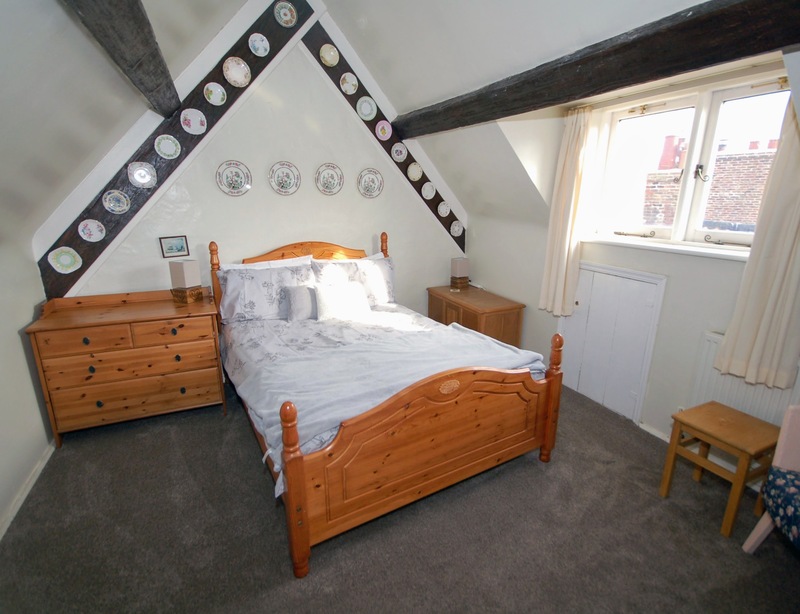 Attic bedroom with double bed and large window with view to King street and Ravenscar. Gas central heating throughout. Duvets on all beds with linen provided on request. Please also be advised that Burton House, in common with many Robin Hood’s Bay holiday cottages, has multiple spiral staircases and some areas with low beams and\or ceiling. Please enquire on booking if you require any more information on these traditional features. Sorry – no smoking or pets in the house. The place was very clean and tidy. Clive was excellent at giving us directions to the place and was very quick at responding to any queries. This house is beautiful plus comfortable and with a ‘games room’, DVD cupboard, a kitchen full of bits that you normally forget to pack, it is just what we wanted for our short break. The proximity to the beach, shops and pubs meant we were in the hub of it all. 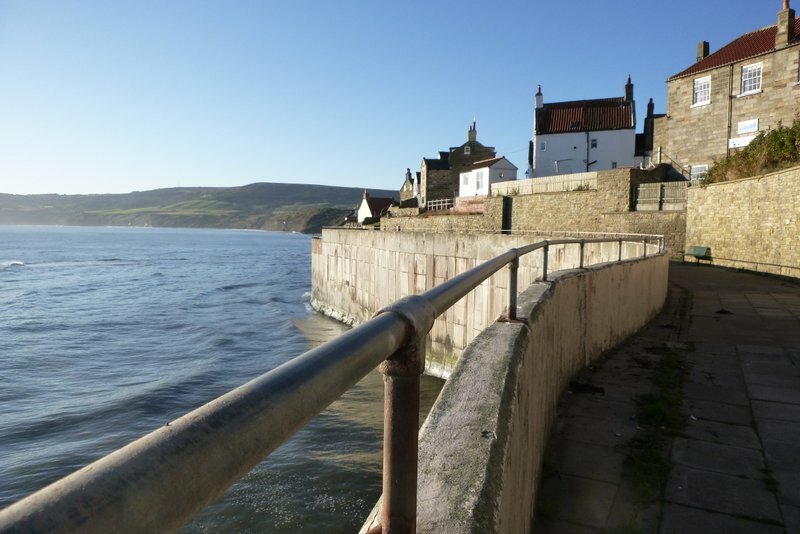 Clive’s communication meant that we knew where to park and what to do at Robin Hood’s Bay. We all had a great time and my girls wanted to move in! Gorgeous location and great house for the able bodied visitor! Also fab fun for young explorers. Hosts are really accommodating and responsive. I can’t recommend Clive’s place enough! it is an absolute gem and such a treat to return to after days spent exploring the local beaches. The views are so beautiful. I would 100% return here. Thanks so much Clive. If you are looking for a unique house to stay in, in a great location, then this house is fantastic. Our family of 5 found this a fabulous place to stay. Clean and cosy, and with a ‘loo with a view’ looking out over the bay! Hosts great and we would highly recommend. Many thanks! Lovely qwirky house with a fantastic sea view from the bathroom window. Sit in the front room and choose one of the four mystery doors…. our 5 year old loved all the nooks and crannies of this four level holiday home. This is a lovely cottage on four levels, but the stairs are steep, and access to the top floor is not for the physically challenged. Also the kitchen beams are low. This is mentioned in the promotional material so no suprises. Not a problem for us, we soon remembered to stoop. There is everything you could possibly need on the premises, it felt just like home. We really enjoyed our stay here. We recently stayed at Burton House for 3 nights. 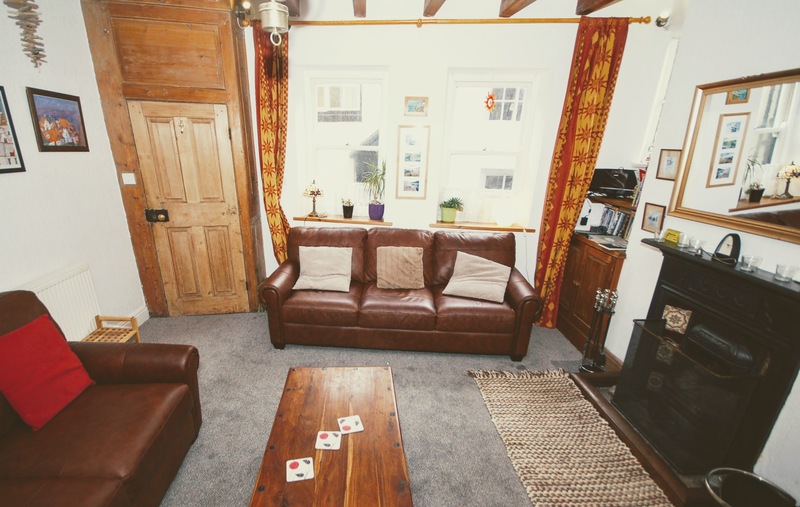 This charming cottage is like a Tardis, the lounge on the ground floor was comfortably furnished and has a working coal fire. 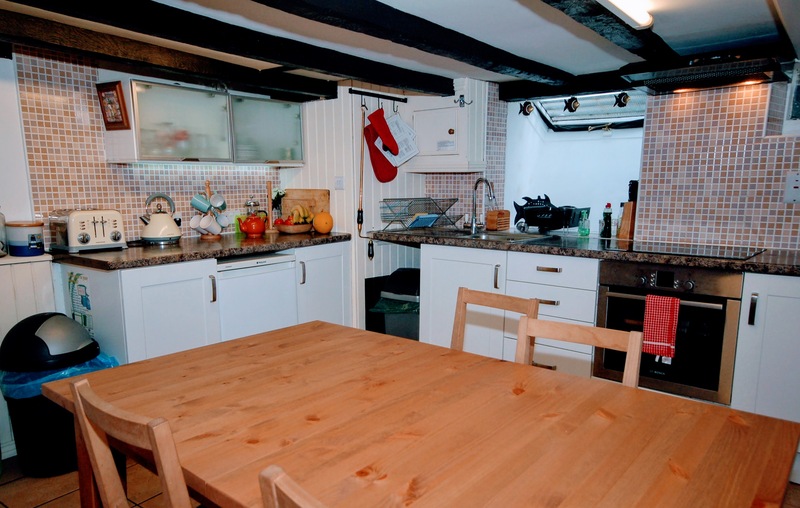 The entire cottage has 4 floors, the kitchen is in the basement with access via quite steep narrow stairs. It is worth the careful descent as the kitchen is fully fitted with clean modern units, washing machine and even a bread maker. The bathroom was very clean and the shower was powerful, the view from the bathroom window is amazing. We had everything we needed, apart from towels which are not provided, but this was the only minor complaint we have. In summary a cosy cottage with character that we loved and would definitely return to and recommend to others. This was the second time at Burton House for me, my wife and teenage son. Quaint and quirky, it was the ideal place for us – Right in the heart of one of the most picturesque villages in England and with pretty much everything we needed. Our only word of caution, is to those who have mobility problems or very young children, who might have a problem with steep and narrow stairs. Otherwise, we are more than happy to recommend this house. This cottage is excellent it had everything we needed for a family, very clean and close to beach, and the owners of the burton house are quick to answer emails for any questions. I would stop here again. Really happy with this cottage which is one of the nicest we have stayed in at Robin Hoods Bay, after nearly 20 years of visits. Very comfortable. Plenty of space for me, my wife and 14yr old son. Generally well-equipped (couldn’t find a teapot – but otherwise there was everything we needed). Well located at the bottom of the village near the sea. Easy to access for loading/unloading from the car – not always so in this village. Would probably book again and would certainly recommend to a small family group like ours.